Mother Board basic for the Gateway and two LDMs. This board provides System 80 with the possibility to have one gateway module (CAN-bus (CGM 85.1), Profit-Bus (PGM 86.1) or Ethernet (EGM 87.1)), as well as two weighing process controllers (LDMs). It is possible to connect further extension boards and more LDMs, which makes the System 80 scalable and cost efficient. The service connection provides an easy way for firmware update via full duplex RS422 /485 interface. 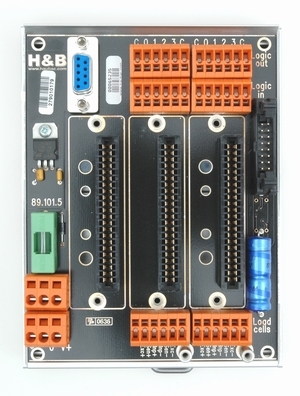 You can connect H&B DOP utility to System 80 via the service connector to get controlling access of each of the LDMs. 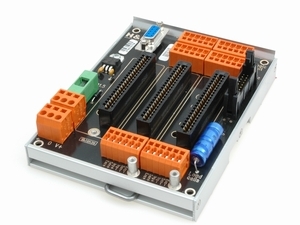 By connecting the motherboard and the extension boards you get an easy and very cost efficient scalability for the weighing process system.